I am 79 years old and for years tried to forget the pain and suffering I witnessed in World War II, particularly June 6th and 7th, 1944. However, in my advanced age I guess I am getting nostalgic. When I read Karl Bischoff’s story I decided to tell you about my memories on LCI (L) 489 at Omaha Beach in June 6th and 7th of 1944. I hope that my story may answer questions that others may have about their loved ones. First, let me give you a little background about myself. I was born and reared in Gadsden, Alabama. I was only 17 when I lied about my age and joined the Alabama National Guard. I served in Guntersville Alabama, Jacksonville Florida, and Camp Beauregard Louisiana. When we were inducted into the Federal Army in 1940, all of us guys who had lied about our age were given a COG (convenience of the government) discharge and sent home. By then I was nineteen and old enough to enlist. My cousin Joseph R. Erwin and I joined the Naval Reserve. My first assignment was at Balboa Park, San Diego where I attended Hospital Corp School. After that, I served in Pensacola Florida at the US Naval Hospital. Then I was stationed at TTSA (Transition Training Squadron Atlantic Fleet) in Norfolk Virginia. I was one of the first twelve men assigned to what later became the US Naval Amphibious Training Station at Solomon’s Island, Maryland. For me sea duty did not begin until 1942. I left Solomon Island, Maryland on board LCI (L) 489. I served as pharmacist first mate for the LCI 489. I was the ship’s “Doc”. The Navy prepared us well for war. As medical officer, I received extensive training on wound care, shock, bullet/shrapnel removal, fractures, bleeding, trauma, stitching, infectious diseases, dressings, bandages, chemical warfare first aid, etc. Everybody got immunizations too. I gave typhus fever vaccine every 6 months, typhoid fever every 12 months, tetanus booster as needed, yellow fever every 24 months and small-pox every 6 months. I also served as Chemical Warfare representative, and Lend-Lease representative for our LCI. Our commanding officer was H. H. Montgomery, Lieutenant USNR. As I recall our LCI ship’s complement included four officers and between 25-28 enlisted men. Around May 1944 we brought on two additional medical men in preparation for D-Day. These men were Burton H. Hockel, Phm1/c NR, and Harold Alvin Kadle, hospital apprentice 2/c. I set these men up in the sick bay to give IVs and plasma. Approximately two weeks fore the Normandy Invasion, the ship was quarantined as a precaution. To the best of my recollection, our LCI and about 5 other LCIs among LSTs, and LCMs hit Omaha Beach just at daybreak on Jun. 6, 1944. Immediately all hell broke out. The German bunkers that were supposed to have been shot out in an air raid weren’t. For two solid days our LCI was shelled. You should have seen my helmet. I wish I had saved it for my kids to see. During the invasion itself, the sick bay expanded to include the mess hall and the deck. The men on our LCI were lucky. We did not have one single casualty. The mess hall and deck were filled with men from the Big Red One and other landing craft along side us. Al Allen, a seaman, brought wounded men to me all day on the 6th and 7th of June. He never stopped even though he took a shot across the knee. He was a good young man. He probably saved more lives than we can count in those two days, literally hundreds and hundreds. I don’t know how he maintained the stamina to keep bringing the injured from the beach onto the LCI. I patched these men up the best I could and got the really injured ones transferred to hospital ships. When Allen couldn’t get the injured to me, I went to them on the beach. When I would jump into the water with all my gear and medical kit, I would nearly go under. The waves with the weight of my gear were not a good combination for jumping into the ocean. It was so loud for two days with shelling and bombing. I’d say, “Watch out behind you Allen” and he would duck, or he’d say, “Hit the deck Doc” and I would hit the deck. We watched out for each other. It seems a miracle now that we did not lose one man on our LCI on D-day. Sometimes the air was so full of fire that it seems impossible that any of us survived. I remember when we rescued men from the Susan B. Anthony. When the waves would swell, our ship would rise up and the men on the Anthony had to judge it just right to get the timing right for their jump across. I remember one young man that just couldn’t make himself jump. He finally tried and had both legs crushed badly. However, he managed to hang onto the Anthony. I climbed up the rope netting/ladder across and slung the young man over my shoulders. I brought him onto our LCI and treated him. I had him transferred to a hospital ship. I never caught his name. I have wondered over the years if he made it home safe. By this time I was 23 years old, in fact, I turned 23 the day after D-Day on Jun. 7 1944. Twenty-three seems young now, but at the time I was one of the senior men on board and these 18 year old fellows seemed terribly young to be fighting. My heart really went out to them. Around 3 days out from D-Day a group of men from our LCI set out on the beach. I treated men from Omaha and Utah Beach. I believe it was an LST that brought in Ernie Pyle, a war correspondent. I think we were actually on Utah Beach when we met Ernie. We talked to him about what we had seen. We were deactivating German bombs that had not detonated and were checking for any survivors. By this time the fighting had moved inland a mile or two. But we still got occasional shells. It was about three days out that I was authorized to give each man 2 ounces of Brandy. It was prescribed to help settle their nerves. That was a common prescription in wartime for shell shock. I want to say a word about Willie Lee Edwards Jr. He was a black man from Dothan Alabama, my home state. Back in 1944, black people weren’t allowed to have many positions or ranks in the Navy. Willie served as steward for the officers. He was well received and popular among the crew. I am proud to have shared my home state with Willie. Willie was a boxer. He would box anyone willing just for fun. Joe Lewis was his hero. I also remember a fellow, I believe it was Murphy from around Boston who always took up for me when the men started talking bad about southerners. He would say “Doc is from the East, right Doc? He is not a southerner. LCI (L) 489 was decommissioned in Nov. 1944 in Edinburgh Scotland. I slept on the ground at Vicarage Barracks in Plymouth England until time to go home. From Vicarage Barracks I came back to Pier 92 in New York. I then had thirty days rehabilitation to recover from a back injury I received when I slipped on deck during the Normandy invasion. I served the remainder of my time at the Naval Air Station in Atlanta Georgia until 1945. After I came home I finished pharmacy school at Howard College in Birmingham (now Sanford University). 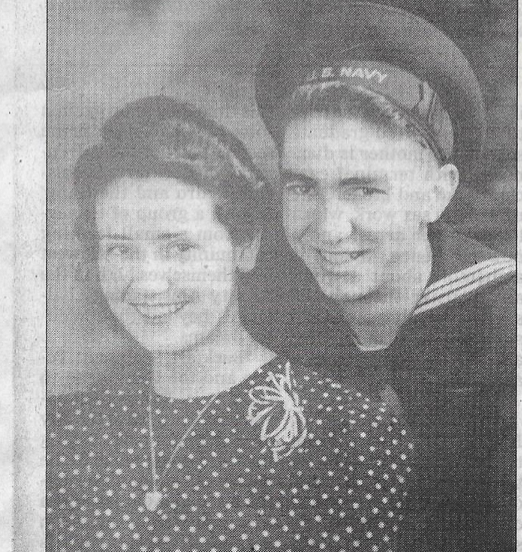 I married Mary Lee Rushing from Elba Alabama who served in Washington DC as a WAVE during the war. We had three children. My son Jim has served his country for nearly thirty years. He flew Cobra jets in Viet Nam. He is an attorney. My daughter Carol works at the University of Alabama in Birmingham Medical School and my daughter Lee works for the Alabama Medicaid Agency. I have four grandchildren.